Our Group Classes are great for socialization, help your dog learn obedience in a real life environment (an environment with distractions) and give owners a chance to learn practical ways to work with their dog at home. Class sizes are limited, so register early! Please see our calendar or contact us for upcoming class schedules. For dogs 8 weeks to 6 months. Must have two rounds of shots. While attending this course, you’ll be able to get information on all of your puppy-raising questions including housetraining, chewing, and the most effective way to teach practical skills such as sit, down, stay and coming when called. This course meets once a week for 6 weeks and includes handouts each week. Each student is eligible to receive an AKC S.T.A.R. Puppy certificate at the completion of class. 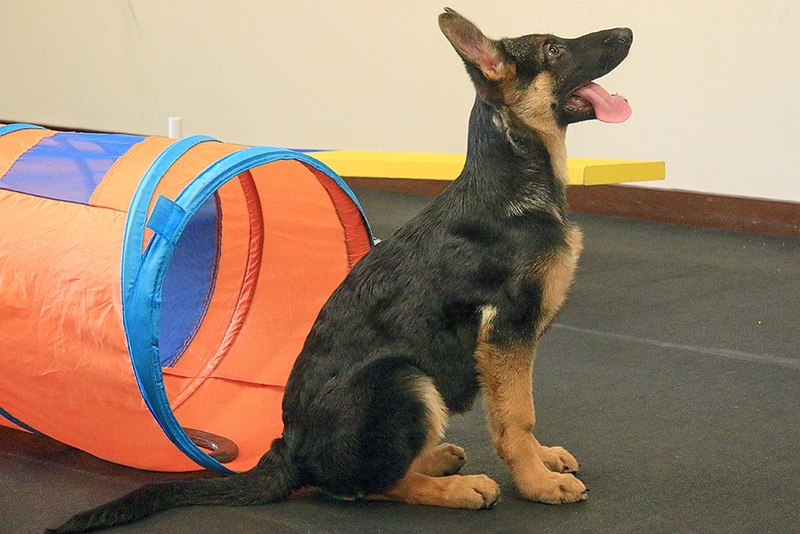 This course is designed for dogs who have graduated from the AKC S.T.A.R. Puppy class and dogs over a year old with no previous formal training. Our basic obedience classes are designed to teach you how dogs learn and help you teach your dog basic obedience commands and appropriate behaviors. Your dog will learn Sit, Down, Stay, Leave it, Drop it, Loose Leash Walking, Heel and Come commands. The classes are fun, fast paced and are designed to establish a rewarding relationship between you and your dog. The classes are comprised of 6 weekly sessions lasting one hour each. This course is a continuation of the basic obedience class. If your dog responds well to verbal commands in and around your home, then this class is the next step in your dog’s education. We will coach you through the process of getting your dog off-leash outdoors. The classes are designed to teach your dog to respond to your commands and remain in them regardless of whether you are at home or in an area full of excitement and distractions. The classes are comprised of 6 weekly sessions lasting one hour each. Want to have fun with your dog and burn off some excess energy? Then this class is for you! Each week we will introduce new jumps, tunnels, weave poles, hoops and shape our dogs behavior to work up to an entire course. This course will challenge your dog to improve his obedience commands and focus his attention towards you while having fun! Tricks class is a great way to continue teaching your dog new things after they’ve learned their obedience. We offer four levels of tricks classes – Novice, Intermediate, Advanced and Expert. The classes teach tricks such as, roll-over, spin, hoop jumping, pick up items, etc. A tricks course is a great way to challenge your dog mentally and physically. Each level course builds upon the previous course. Tricks class is a great addition to our basic obedience, advanced obedience, agility or even therapy dog classes. There are no prerequisites for the Novice class. The classes are comprised of 6 weekly sessions lasting one hour each. This course is a great way for owners to get out and about with their dog. Each week, for four weeks, we will meet at a different location to work on manners in public, socialization, confidence building and more. Dogs and owners wishing to take this class must have previously completed a basic obedience course. Canine Scent Work is a course that develops your dog’s natural scenting abilities through fun and games. Dogs have an amazing sense of smell, but often don’t have an outlet to perform this task. This class is perfect for dogs of all shapes, sizes and ages. Canine Scent work will help build your dog build confidence, burn off mental and physical energy and teach them to use this skill for good. The classes are comprised of 6 weekly sessions lasting one hour each. We know that getting puppies lots of positive exposure to the world around them is crucial to raising a well-adjusted dog. That’s why we offer puppy social parties, where puppies 8 weeks to 5 months can come to meet new friends and check out a new place. It’s not enough that puppies just get out in the world; we also need to make sure that they’re experiencing it in a positive way to help avoid behavior problems like anxiety or aggression in the future. That’s why all of our puppy parties are carefully supervised by certified trainers with lots of experience in safe puppy-puppy interactions. Have a puppy question while you’re here? No problem! Our trainers are always happy to help! Dog Park Hour is for highly social dogs who are already existing (or past) clients of PPDT. Consider it a VIP dog park of sorts. No need to be out in the summer heat, rain, or with the mosquitos when you can come enjoy our climate controlled indoor play and training arena. Just like when kids are playing in a pool, there will be “lifeguard” on duty; in this case, a certified professional dog trainer. Dog park hour is designed for you to come with your dog, enjoy the companionship of other responsible dog owners and their friendly dogs, and have the added assurance that one of our qualified behavior professionals is on site to monitor play and answer training related questions. Learn how to tell when your dog is no longer having a good time and what to do. We’ll create scenarios that allow you to read your dog’s stress signals and teach you the skills to react accordingly. You’ll also learn how to know when your dog has had enough and how to end the visit happily. Practice multi-tasking by handling your dog through various scenarios, because during a visit, you’ll need to be aware of what’s going on around you as well as what’s going on with your dog. Through these teaching scenarios, your confidence and your ability to handle any situation will increase greatly. Build teamwork skills by exposing your dog to a variety of elements such as loud noises, maneuvering in tight spaces, slippery floors, strange objects and toys, medical equipment and strange vocalizing and body movements. This creates the strong relationship needed to make a therapy dog team that is a joy to watch.